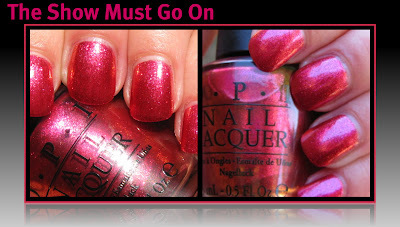 I picked up all of the shimmers from OPI's Winter/Holiday 2010 Burlesque Collection, and just one of the glitters. Today I have the shimmers for you, and bonus doggie photos to show you what they do while I swatch! Below: Rising Star is a beautiful gold shade with hint of copper. 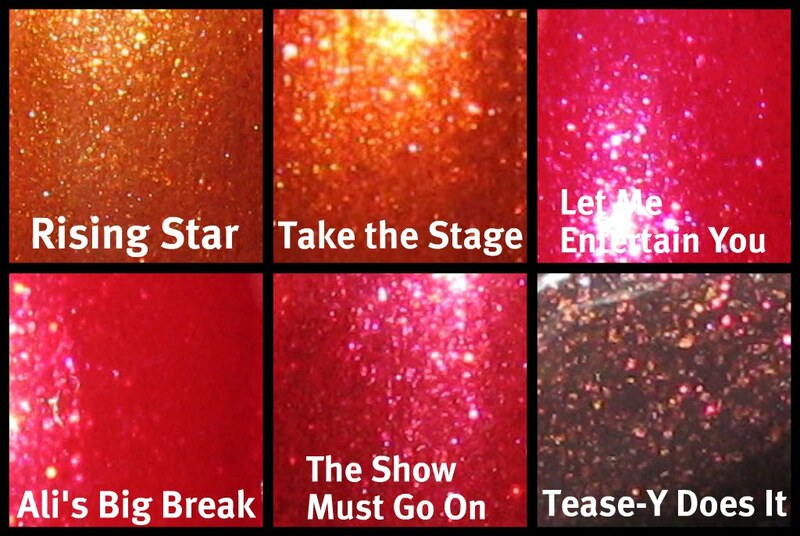 I used 2 coats on all of these and as with the majority of OPI polishes, the formula was perfect. 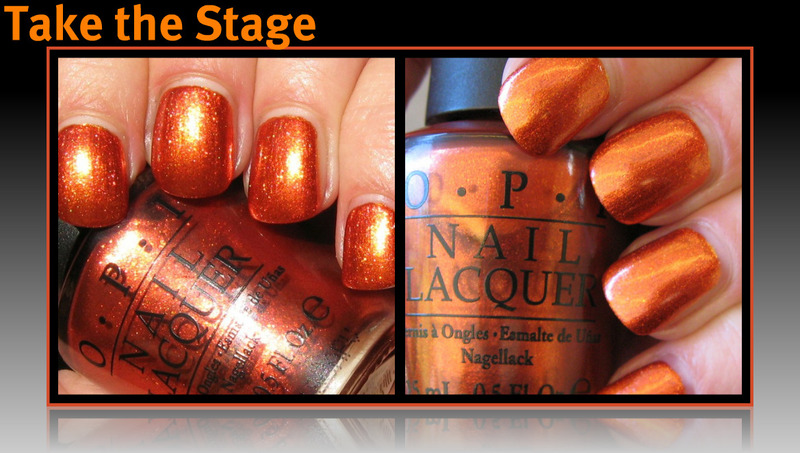 Below: Take the Stage, a bright rich copper shade has a very nice "glow" to it. This color is perfect for Fall. 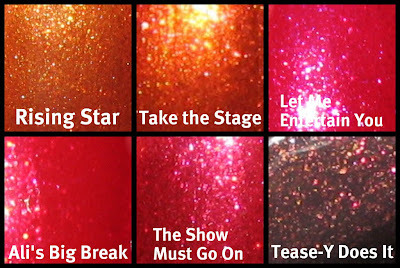 Below: Tease-Y Does is one of two shades in this collection that doesn't have a bit of metallic or foil look to it. Ali's Big Break is the other one. It's a near black creme with hints of purple, and gold and bright burgundy glitter. In certain lighting (middle photo) this vampy beauty takes on a more brown-toned hue with almost a haze of smoke over it. Very nice! Below: Ali's Big Break is so much prettier in real life, and I apologize that my photos don't do it justice. 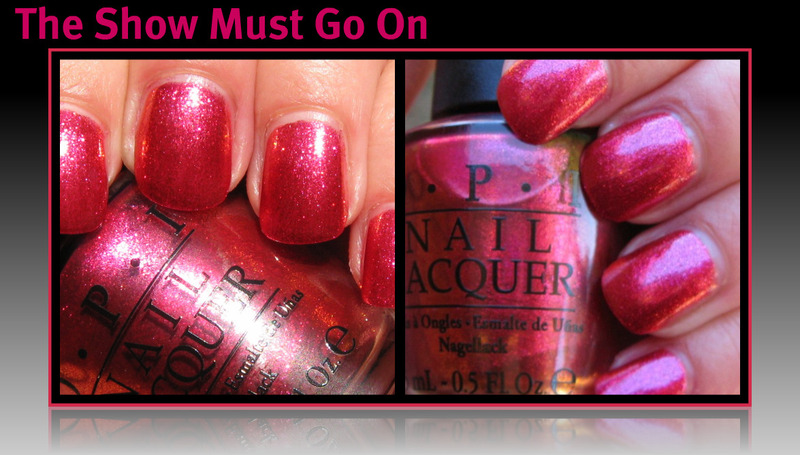 This cool-toned cherry red creme with red foil and gold glitter is a gorgeous red with very little pink tones in it. Below: The Show Must Go On is a little bit like MAC's Bad Fairy, but just a very little bit. 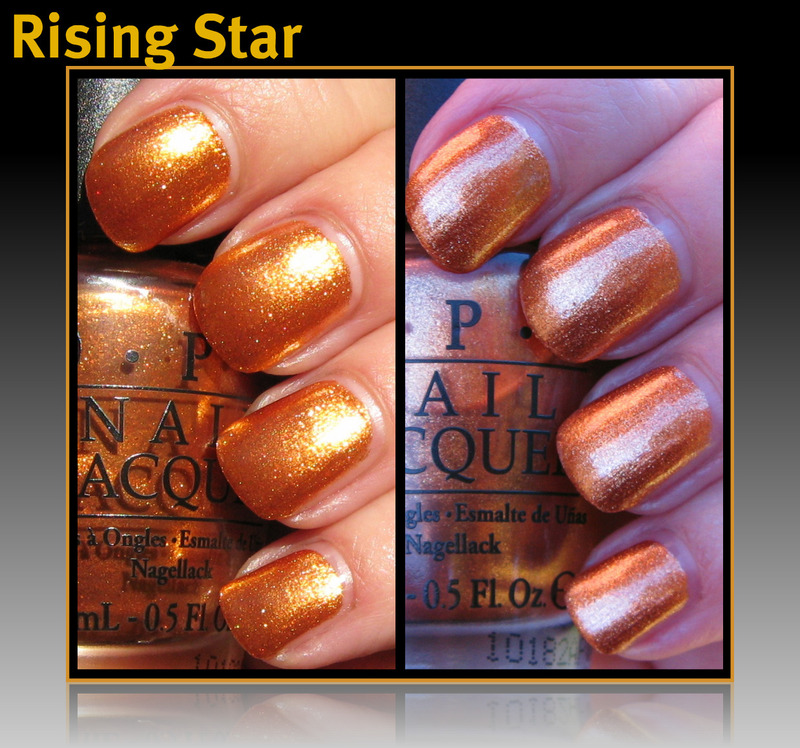 It has a touch of a gold duo chrome and the shade is a toned down pink/red color. 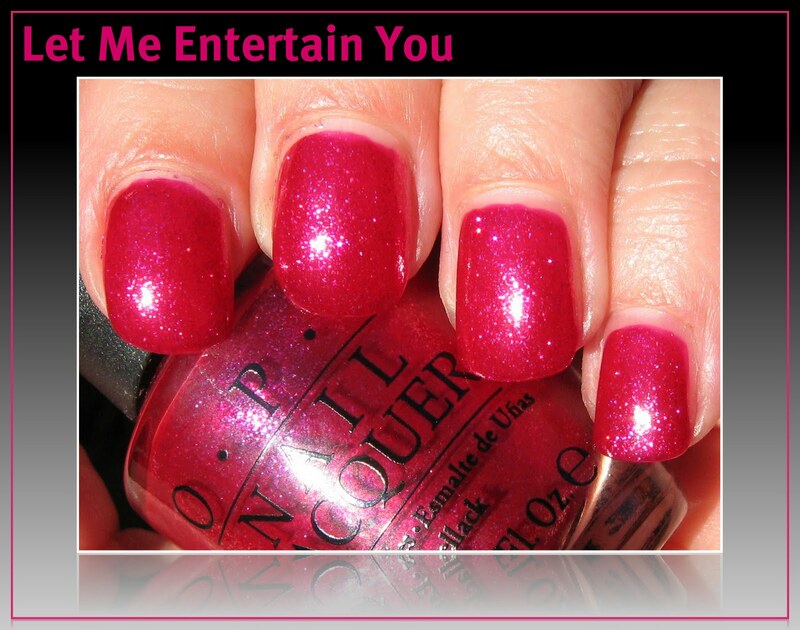 Below: Let Me Entertain You, a darker fuchsia pink tone, is somewhat less foil/metallic than some of the others in this collection. It has an abundance of foil/glass-flecked glitter that's a little lighter than the base color, and I see some silver glitter in this one also. 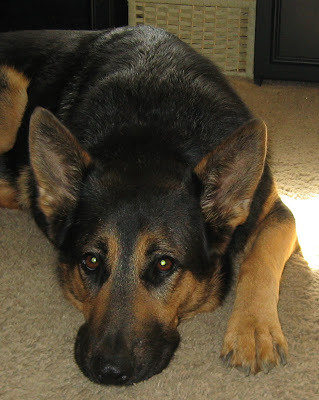 Below: This is Gus, our male German Shepherd. He waits patiently as I swatch, because he knows with every different color, that means another trip outside. So it's in and out, in and out with him. 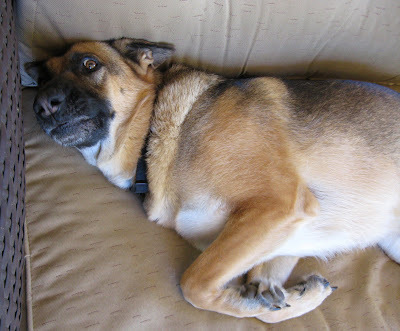 Below: Greta on the other hand, is a little lazier! She just lays on the patio furniture waiting for us to come back out. She knows every time I come out, she gets to play catch. I'm very happy with all of the shimmers from this collection. There's a range of finishes--from the creme ones with tiny glitter to the more metallic/foil ones--and the shades themselves are all beautiful. There's a little bit of shimmer, a little bit of metallic, and a whole lot of gorgeous in this collection. Awww, I love your dogs! The pictures of them make me wish I could love on my fat, fluffy yellow Lab, Hank, right now! Gorgeous shimmers! And I love it when you post pics of Gus and Greta! They are both such beautiful dogs, makes me miss my Maxwell. Thanks for sharing with us! I definitely need the last 4 shades you displayed, gorgeous!!! God bless you for rescuing German Shepherds. Your an angel for doing that hard and wonderful work. I'm not sure which polishes I'll buy from this part of the collection. I know I want all the glitters. I guess I have to see swatches a few times. I just noticed your new photo. You look beautiful. I love the new haircut. Very modern and just adorable. All the nail colors look pretty :) and cute dogs!